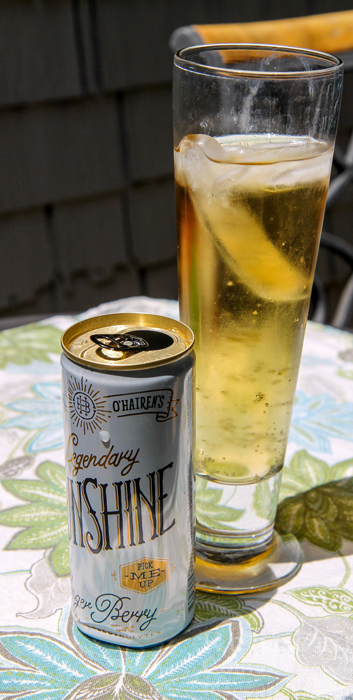 Sunshine Beverages, out of Winston-Salem, NC, invited me to drink the Sunshine. No, there was no LSD involved in that exchange. 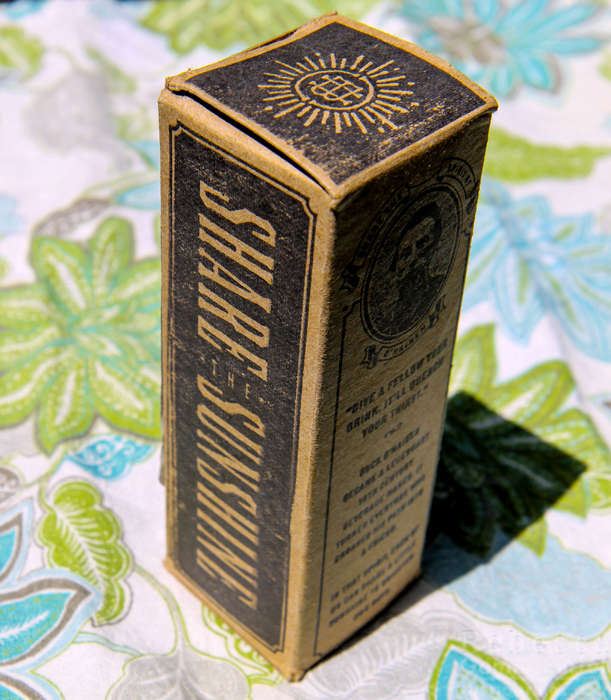 Sunshine is the name of their energy drinks, lightweight alternatives to the metallic sludge of a Red Bull or Rockstar. I realize some people are quite addicted to those products, but I, assuredly, am not; I can’t even stomach a full can. Yet I am occasionally in need of a caffeine pick-me-up that doesn’t involve the acidity of coffee, especially in the late afternoons. An extra dose of electrolytes and Vitamin B12 doesn’t hurt, either. Enter Sunshine. As you can tell, this is a company banking on fun, mainly imagining a legendary Buck O’Hairen, 18th century moonshiner, who decided to make an alternative to the hangover that followed moonshine consumption. He’s quoted on the charming, if excessive, packaging that the can comes in. But the real joke is that O’Hairen never existed at all! That doesn’t matter to this spinner of yarns. So how does Sunshine Ginger Berry taste? Unlike the previous energy drinks listed, its flavors are appealing, if ever so slightly chalky. The berry tastes exactly the same as it does in all those new waters advertising a touch of fruit, no sugar, such as Hint and Metromint. Stevia provides a tad of sweetness, but only a minimal amount. I love that electrolytes are added as well, as I think they’re a healthy way to boost joie de vivre, which we don’t always get naturally. Along with the B12, the electrolytes provide a slight metallic tang–less so than most mineral waters. I’d say that tang blends nicely with the subdued ginger and berry flavors. Instructions: Shake the first four ingredients together with ice. Pour into a highball glass or other large tumbler. Top off with Sunshine. Stir lightly. I specify a wheat-based gin in this recipe because, in my experience, wheat-based gins tend to be softer on the palate and more restrained in their use of juniper, which could overpower Sunshine’s more delicate elements. Also, they are the only gins I like, which makes them a lot more appealing to me! 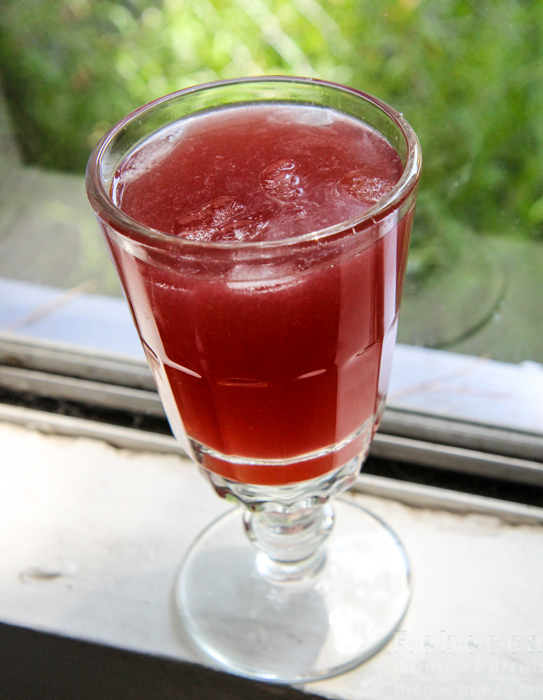 I used Spirit Works Distillery’s gin, but TOPO’s Carolina Piedmont would also work well. For the ginger liqueur, I went with SNAP, which has spices in its molasses base that complement gin’s components. Domaine de Canton would also be an interesting choice, but expect a more vivacious flavor and perhaps dial down the lemon. The amount of blackberry juice I used might be considered small, but I think it works best when not dominating the mix. Here, it doesn’t drown the Sunshine but amplifies its berry undercurrent. Trader Joe’s has affordable blackberry juice. Overall, I think the Summer Dance is a good cocktail and one that could easily be livened up with a ginger-infused simple syrup or the use of lime instead of lemon. 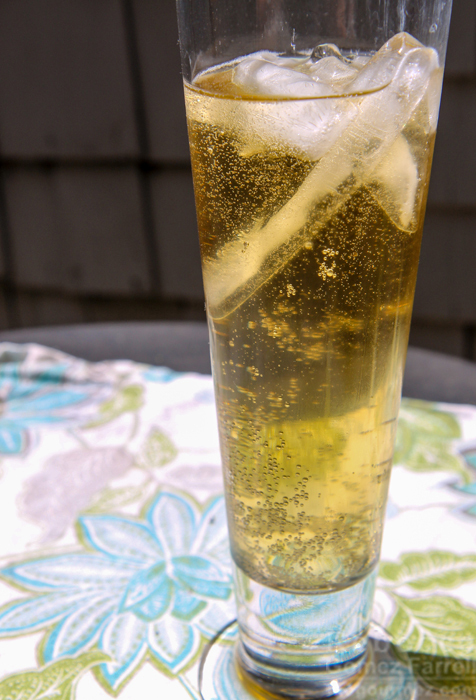 But I was in the mood for a backyard sipper, so soft and refreshing was my aim. And yes, that glass is an absinthe glass, not a highball glass–I don’t own any of those. Also, the cocktail pictured is deeper in color than the end product, because I took the shot before I added the last bit of Sunshine to it and it was pretty, so I kept it. Call it food blogger magic if you’d like, but don’t be surprised when your final drink has more of a dusky rosé hue. You can buy 24 packs of Sunshine Ginger Berry on Amazon for $45.00, which is slightly less than two bucks each. The Blueberry Lemonade and Clementine Twist are also available, but in 12-packs for $22.50, which breaks down to about the same cost. If you live in the South, you may also be able to find it at a local liquor or specialty foods store or Lowes Foods–lucky you! Enjoy! One more Obligatory Disclaimer: In case it wasn’t clear, I received a complimentary can of Sunshine for review.